What a long Monday back at work and it’s my least favorite week … no, not that week. It’s my turn to be on call for work. And I got a call towards the end of my run this evening which continued with a few calls while I was trying to make dinner. Overtime is good, overtime is good… The first half of yesterday was a great day at home relaxing and moving mountains with housework. Since it was cold and raining most of the day, I was perfectly happy to tackle home projects and enjoy the Sunday paper. Well, I tried the paper part. 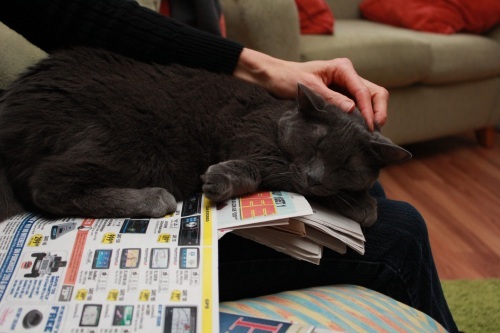 Newspaper is a cat magnet in our house, if you have it on your lap, there will be a cat on it shortly! 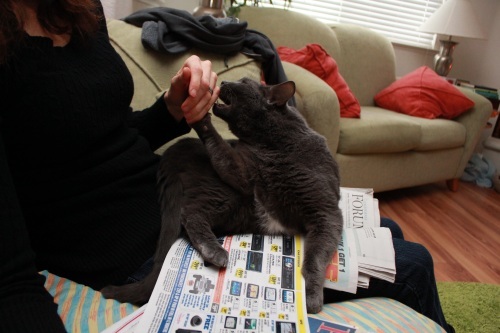 Because there’s nothing like a warm paper lap, especially when there’s paper to shred and hands to attack. It’s a Sunday ritual here and that’s okay, I didn’t need anything from Best Buy anyway! Later my dad came over for a jewelry photography session utilizing our new camera and gear to sell estate jewelry for a church. Since he’s my father, I agreed to help him with this project, but selling used jewelry is a hugely time-consuming project! First getting everything appraised and proper listing details for it, then getting quality photos to sell online. Obviously a cheap point-and-shoot camera won’t cut it, so I took the opportunity to learn my camera and macro lens more taking many shots like this. It was fun, but I have lots to learn for taking jewelry pictures. And I have my work cut out for me this week listing everything on Craigslist. Yay. 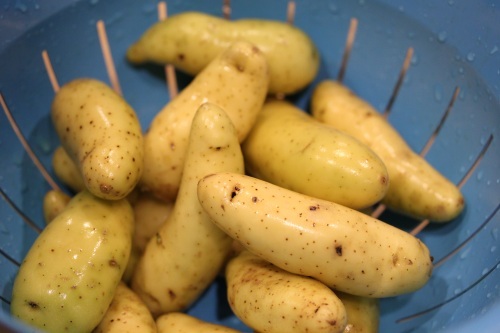 In my last farm box, I got a bunch of fingerling potatoes that I needed to do something with. 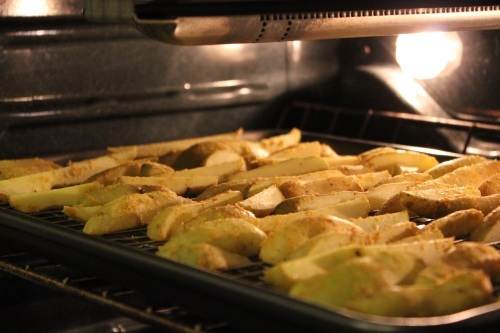 I chopped them into quarters for wedges/fries, tossed with a little olive oil, nutritional yeast, garlic powder and salt. Then baked at 350 degrees for an hour. And I created a new dressing for my salad tonight while looking for inspiration to use up some beets. I forced myself to buy some beets on the last Whole Foods trip because I don’t have them nearly enough, they’re not easy to work with staining everything they touch and tough to cut into and use raw. But they’re loaded with vitamins and are an especially good source of iron and vitamin C. And their sweet flavor goes wonderfully with citrus. Place all ingredients into a high speed blender and blend until smooth. 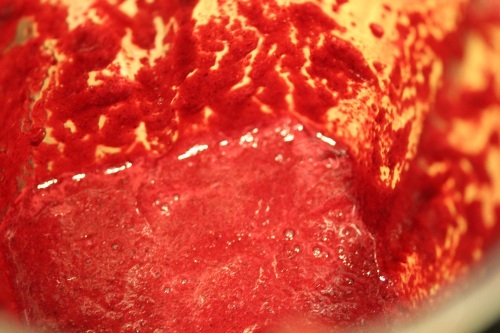 Raw beets are very tough, so some blenders might protest. You can steam the beets to soften before blending if needed. The end result is a beautiful neon pinkish purple dressing, hard to believe a veggie created this. And it turns just about everything in the salad red, but it makes up for it in flavor. The citrus tang and sweetness blends nicely while the dill and mustard add a subtle savory kick. Dill does surprisingly well with the sweetness of the beets. 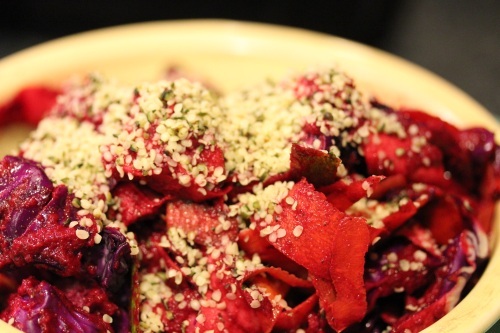 Hard to tell, but there are carrots, zucchini, celery and red cabbage in the salad topped with hemp seeds. And it made a great pairing with my fingerling potato fries. 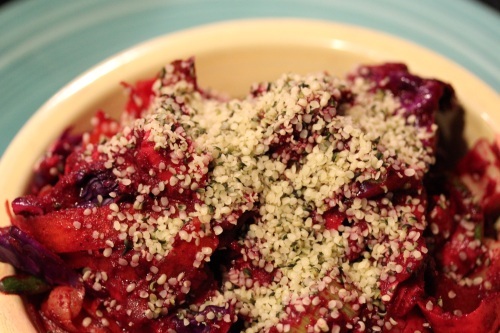 If you’re looking to add more beets into your diet, give this dressing a try. And it would probably be fun to serve on Halloween since it makes any salad look like zombie gore! Raw beets will be a great test for the Oster, even the Vita-Mix sounded a little angry about it. Ok your site just gets better, daily! And so do your pics! Between the site re-do and the new camera, it’s like a brand new site..a total bloggie makeover and it looks GREAT! The macro lens for your camera. Which lens did you get? And do you keep the camera on auto and just let the camera and lens do the work for you? Or do you go onto manual settings? Thanks, I’ve been making little tweaks here and there even though time is limited this week! I love the new site layout!! Looks great! And I LOVE that ring, ha! 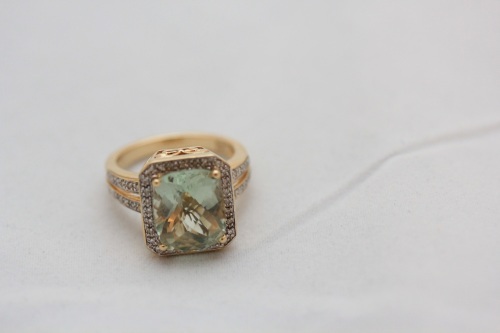 I could see that jewelry would be really hard to photograph– what backdrop did you use for that? Thanks! :-) I have a pop-up photography tent hubby got me for Christmas that has different back drops and I used the white micro fiber one. I totally know what you mean about the selling thing being a big pain! 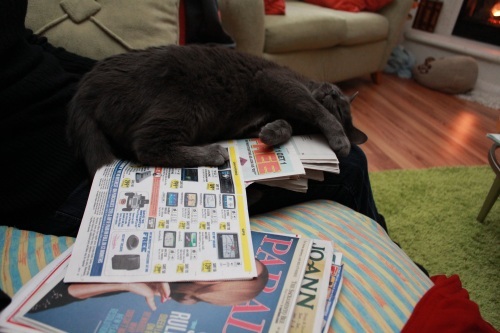 My mom had me sell a bunch of things on ebay a couple years ago…and it is SO tedious to appraise, list, photog, etc. The money was worth it…I guess. 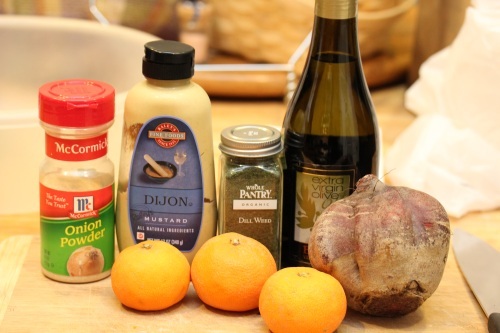 I’m so glad you posted this dressing recipe—I have some beets sitting around that I need to turn into something today and I’m not in the mood to eat them! Oh Gosh that dressing looks AMAZING! I really wish you could just come here and make all my meals for me!!! Wow that ring is beautiful, I hope your dad sells alot! p.s. LOVE the new profile pic on the side! I always have to force myself to use/eat beets… I get a lot in my CSA share – this looks like a great way of using them – I’m excited to try it! Ok, this sounds incredible. All of it. 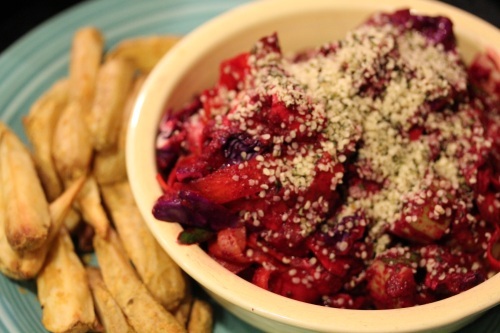 I love the creative use of the beets to make this flavorful dish! And anything roasted works for me… especially potatoes with nut. yeast. I’m making this tomorrow night! YUM! That’s funny, I grew up in the bay area and now live in the Sac area. :-) We should totally do a meet up at a Cafe Gratitude location, that would be fun!